Kelvarhin: How did you discover Tolkien? Are you a book-firster or a movie-firster? I’ve read Tolkien before I’ve encountered his books in primary school. And a good thing too! We’ve only read some very short fragments then and without any context behind them it was a total disaster – most of my friends thought that Tolkien’s dwarves were the same kind of dwarves as the ones from “Snow White”! But high school… ah, high school! The golden years! Apart from PJ’s movies and people finally understanding what a hobbit is, I’ve met some really wonderful teachers, great Tolkien fans. My philosophy teacher was a member of Loża Tolkienowska (Polish Tolkien Society) – I used to write my notes from that subject in tengwar and all of my essays always received top grades, because – no matter what the topic was – I’ve always managed to include a good portion of Middle-Earth along the way! My Polish teacher allowed me to conduct several lessons about Tolkien for my class-mates; I also remember she gave me an A on “Macbeth” analysis, because I was the only student in class who was able to name another book in which the forest is storming a castle! (laughs) We also had this annual “First Day of Spring Celebrations” during which you could go to school dressed as whoever or whatever you like. I’ve won two contests for the best costume in a row with my humble Nazgûl outfit, which was quite an interesting achievement in a catholic school! (laugh) Though I must add that my sword – even though it was plastic – always got confiscated by the headmaster before the day was through. Perhaps he was fooled by the elven runes I’ve painted on the blade and thought the sword was authentic or – more likely – he just enjoyed starting his history lessons by laying a sword across his desk! (laughs) I’ve always thought it was a pity he didn’t join the contest himself – he was a monk, you see, and he had this really cool, black, billowing cloak and, grasping my sword as he walked through the school corridors, he’d make a pretty good Ringwraith himself! So as you can imagine, I’ve grown up in a Tolkien-loving family, in a Tolkien-friendly school, also in a very Tolkien-enthusiastic city, with numerous Tolkien-events. And Gandalf’s words – “All we have to decide is what to do with the time that that is given to us” – were and forever shall remain my single life credo. Kelvarhin: What first inspired you to start the Oakentoons? Seriously! I was a high school student then, I’ve read the books some time earlier and PJ’s movies were about to hit the screens. There was an unforgettable sense of excitement in the air and I was a notorious doodler with more than enough free time to spare. That is when my first Middle-Earth comic was created. 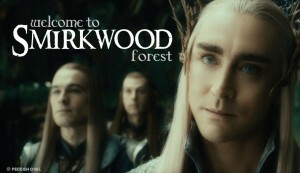 Like the Oakentoons, it was also a parody, but it focused purely on the plot of “The Lord of the Rings”. I’ve been drawing it for about four or five years – more than 100 pages, over 2000 images and I only got as far as the battle of Helm’s Deep. It became very popular with my friends and with their encouragement I’ve decided to publish it on the Internet. I was working voluntarily for a Polish website about “The Lord of the Rings” then, www.wladca-pierscieni.pl. It belonged to a large movie portal which wanted this site to be purely “Lord of the Rings” movies-orientated, but me and two of my colleagues found this concept too limited for our liking. We’ve managed to turn it into one of the biggest Polish Tolkien websites of that time, with over 2 million views per month. You probably won’t remember but we used to exchange news with TheOneRing.net quite regularly! 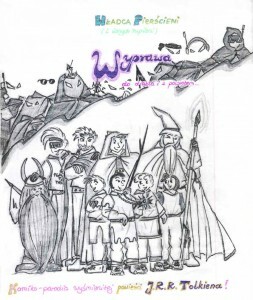 And said site became the first kind publisher of my Middle-Earth cartoons. Technically that comic was far from being perfect. I’ve drawn it in a notebook using nothing more than a pen and a pencil. But the ironic, sometimes abstract sense of humour which sprang out of the speech bubbles was enough to make my readers forget about its imperfections originating from the fact that I was writing it on my knee, between lunchbreaks and homework. Hmm… I bet some of that ancient lunch is still between the pages somewhere! Nevertheless, publishing it on the web turned out to be a good decision. It made a lot of people laugh and I gained a wonderful group of loyal readers – they even hacked our server once to get to the upcoming episodes. I also got interviewed about my work for a popular computer magazine, so déjà vu et vécu you might say! When I’ve heard that PJ was going to film “The Hobbit”, I was overjoyed – it was like going back to all of these wonderful years when the greatest Christmas present you were expecting to receive was another 3,5-hour ticket to Middle-Earth! Sadly, a lot of things changed in my life since the last “Lord of the Rings” movie premiere – growing up being the worst of them all. Since fate decided to push me into the welcoming though rather throttling arms of medicine, free time became quite a luxury and I was forced to limit my favorite hobbies – writing, sketching and playing RPG. But when I’ve finally re-visited Middle-Earth in December 2012 my imagination lit up like a supernova again. The problem (or a blessing perhaps) is that there’s a very limited number of things your brain can remember and when it’s already full of 1000-page medical books your thoughts tend to overflow. The Oakentoons became the outflow of what started to stir in my head after seeing “An Unexpected Journey” and my DeviantArt account… have you read “Harry Potter”? 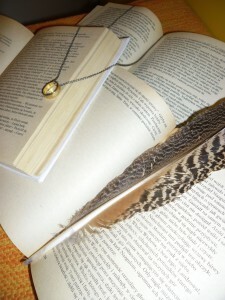 Well, I wanted to use it in the same manner Dumbledore used his Pensieve – to store away some ideas I didn’t want to loose but had no place left for them between my ears. Kelvarhin: Where do you get the ideas for each Oakentoon? PeckishOwl: It began as some random ideas – mixing quotes, movies and situations. 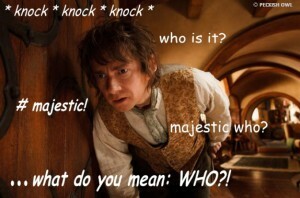 Some of the first episodes were inspired by the blog “The Magnificent Home of Thorin the Majestic” at thorinissomajestic.tumblr.com. It made me highly aware of the fact that Thorin Oakenshield – clad in a troll sac, mauled by a warg or covered in the Goblin King’s spit – was, is and forever shall remain a very majestic dwarf! (laughs) You should also thank its authors for the majestic hashtag, which regularly appears in my Oakentoons – or blame them if you prefer. A lot of fans had been asking me about my other than DeviantArt blogs and accounts, so I’ve decided to create a Peckish Owl facebook page where I publish links to all of my DeviantArt submissions and a lot of owl photos (come on, who doesn’t like small, fluffy owls, ha?). 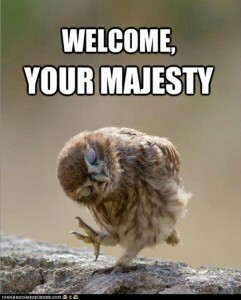 Funnily enough, thrown into the role-playing society, Peckish Owl began a life of her own – as the chief ambassador of the Mirkwood birds, who observes The Impressive Adventures of Thorin the Majestic as he enters her domain and is more than sceptical about them! To sum up, the Facebook Company is tons of fun and you should definitely check it out. Just look for the Thorin Oakenshield’s page with the biggest ego… I mean: army! (laughs) More than 40 000 followers already and still – they just won’t give up! 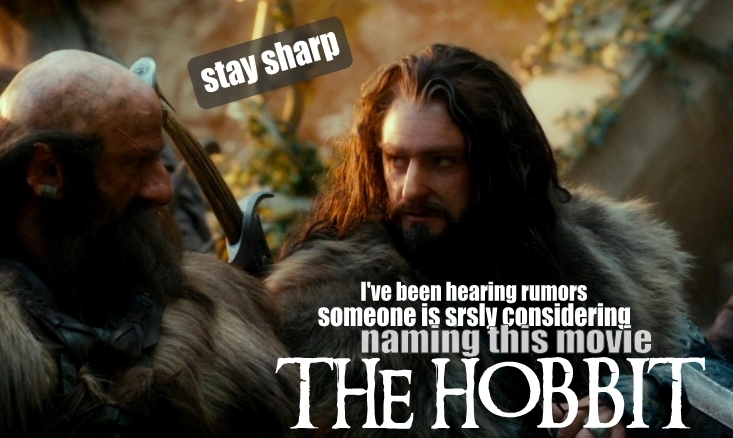 Some Oakentoons are my own private responses for rumors and trends surrounding “The Hobbit” movies. For example: there’s gossip that Kili’s going to have a romantic relationship with an elf. Why discuss Tauriel when he could have met Arwen during his stay in Rivendell? And there you have it – Oakentoon #18. Thorin hugs Bilbo and a >1000 fanfic stories bearing the tag “Bagginshield” come alive. Shippers! “They strike in the wee small hours, when everyone’s asleep…” says Oakentoon #20, #57 and #58. And why does Galadriel have a soft spot for Gandalf all of the sudden, eh? Why does she, when you get right down to it, support Thorin Oakenshield’s quest? How come nobody noticed that Azanulbizar lies on the doorstep of Lothlórien? Thrain got lost… or did he? (suggestive cliffhanger) The horror continues in Oakentoons #15, 46, 47 and 48. Lastly but most importantly, I pay a great deal of attention to what my fans are writing about each episode. They’re responsible for the Troll Joke (comments containing the word “troll” but describing, in fact, mostly elves) which originated from a comment stating that Elrond should be called Trollond – for trolling poor Thorin on numerous occasions. They’ve invented Smirkwood, they’ve been asking for a Valentine-themed Oakentoon and for an explanation how did the dwarves manage to ruin Bilbo’s bathroom… It may seem a bit ceremonious to say, but I love my OakenWatchers! 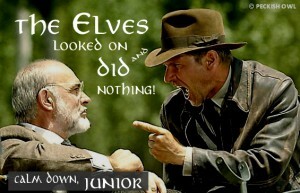 I regularly invent some funny contests for them to join – to name their favorite movie or TV series for an Oakencrossover, to pick an elf from the trilogy forced to face his #majesty (poor Haldir…) or to imagine that Thorin Oakenshield reappears in “The Lord of the Rings” and where, when and what would he be doing there. Their best ideas are put into my cartoons – OakenSpecials. Some of my fans even create their own artwork based on my mischievous undertaking. So the whole idea of the Oakentoons continues thanks to them, both metaphorically (heart-warming support) and literally (a premium DeviantMembership granted me quite unexpectedly by an anonymous fan). I usually write about my inspirations in the descriptions under each episode, so if you’re curious be sure to check them out! Kelvarhin: Do you have a favourite toon? PeckishOwl: Mwahaha! The answer is: YES! So far it’s Oakentoon #34 – “Why he came back”, in which Thorin asks Bilbo a serious and important question and receives an answer far from his liking. According to the number of views, likes and downloads however, the three most popular Oakentoons among my fans would be #10 (“They’re taking the hobbit”), #16 (“Blades of Gondolin”) and #27 (“The only one he ever loved…”). Kelvarhin: You seem to be able to marry up the perfect facial expressions for each toon, with this in mind, how long does it take to create each toon? PeckishOwl: Since the DVD and the Blue Ray came out it’s a matter of an hour or so. Before that, it was a struggle. There were many “An Unexpected Journey” photos on the Internet, that’s true, but apart from the promo and the trailer ones most of them had terrible quality. You can still see them among the first Oakentoons – perhaps I’ll make a re-edition of these episodes one day, if I have the time. I’ll be probably facing the same problem before “The Desolation of Smaug” and “There and Back Again” get released on DVD as well. The Oakentoon headlines appeared around episode #17, in January 2013. The unexpected support I was receiving made me think of continuing the whole idea as a weekly-updated comic series, so I wanted to make it look more official. But not too official! I find myself thinking, again and again, about changing the font – from the good-old Comic Sans to a more individual one, but so far I have restrained from doing that. I think Comic Sans keeps the Oakentoon atmosphere at a cosy and not-entirely-serious level. I reserve the individual fonts purely for the punchlines or words I want to emphasize. Kelvarhin: Which do you prefer working on, the Oakentoons, Oakenstills or Oakencrossovers? Are any of them easier to create than the others? PeckishOwl: Since the greatest joy of the whole OakenEnterprise comes from reading the comments of my fans, I’d say I prefer working on the Oakentoons. It may seem that the Oakenstills are easier to create than the toons, but that’s not true. The idea for the Oakenstills is that they’re supposed to be just one image with a catchy punchline. Therefore it has to be a very good punchline and a well-chosen image because you don’t have the space for a build-up that you’re allowed to have in both the Oakentoons and the Oakencrossovers. The easiest OakenArt to make so far was the Oakencrossover with “House MD”, because it was the very first submission based on “The Hobbit” which came into my head after seeing “An Unexpected Journey” (though it waited in line before I’ve decided to publish it). You see, I wasn’t entirely convinced about Thorin’s unexpected change of character at the end of the movie and about the hobbit-hug, however adorable it was. Being a medical doctor I just couldn’t stop myself from explaining his #majesty’s strange behaviour with the aid of science – and that’s why Gregory House himself supplies you with a medically valid diagnosis of this interesting case of a 195-year-old, previously healthy dwarven king! I’m actually thinking of creating another House-themed Oakencrossover in the future. I mean – why was Thorin just lying there, flat on a stone before Azog, unable to reach for his sword, yet still fully conscious and without any apparent signs of concussion or head trauma, eh? Why would he faint later on? And believe me – I’m not the only one asking such inquisitive questions! I organize annual viewings of the extended “Lord of the Rings” for my friends, most of them medical doctors, and last year we had this half an hour discussion about which of the three arrows Boromir was shot with was the fatal one. A team of cardiologists, transplantologists and internal diseases specialists agreed it was the third one… although the sneaky cardiosurgeons did try to convince us it was the arrow number one. Kelvarhin: Did you ever expect them to become as popular as they are? PeckishOwl: I would never have guessed that they’d become a regular comic series, nor have I ever dreamt of such publicity! I am deeply honored by your interest and, honestly, I feel I really don’t deserve it. There are dozens of fantastic artists out there, who spend many hours drawing, painting and sketching their unique and beautiful Middle-Earth creations – Anita Schmidt-Pabst (aminawolf), Jian Guo (breathing2004), KnightJJ, Kinko-White, evankart, Niken Anindita (megatruh), SceithAilm, Fabio Leone – just to mention some of my favorites. These are the people you should worship for their talent! Me? I’m just a humble scriptwriter. And – quoting my beloved genius of irony, Woody Allen – I don’t want to achieve immortality through my work; I want to achieve it through not dying! Kelvarhin: Do you plan to continue them when DoS and TABA come out? I create most of my Oakentoons at the only moment of the day when I have some free time – when I’m eating my supper. 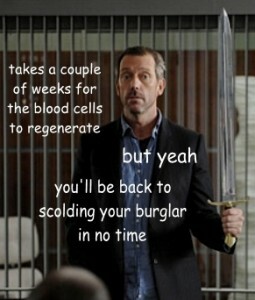 And since I do have to eat sometimes you shouldn’t be worried about the upcoming episodes! 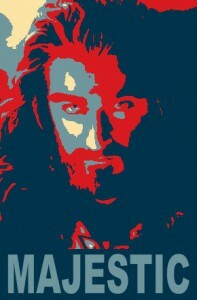 Kelvarhin: Which are your favourite characters from The Hobbit and LOTR, besides #Majestic Thorin? PeckishOwl: Are you unarmed? Good! Here’s a dark little secret – I absolutely loathed Thorin Oakenshield from the book. Same goes for Boromir. And the funny thing is that these two characters – Thorin and Boromir – became my number one heroes in PJ’s movies. This only proves how PJ’s interpretation of Middle-Earth differs from the book – or at least from my vision of what the book was trying to portray. His Thorin remains equally proud but this time his purposes seem far more acceptable – he wishes to reclaim his kingdom (though it does look he cares more about this concept than his actual, exiled people) and its wealth is just a perk (though an important one, that’s true). All of the dramatic events in his life, especially the noble deeds he performed for his kin, are underlined with heavy exclamation marks, mostly for cinematic reasons I guess, but the message they’re trying to pass on has convinced me far more than the subtle suggestions of their existence from the book. Same goes for Boromir – I’m not ashamed to say that each time I watch the extended “The Two Towers” I shout along with the soldiers as he makes his inspiring speech in Osgiliath. For Gondor! In the books, Thorin’s and Boromir’s backgrounds are very limited and are supposed to be their assets. In the movies, their backgrounds are a heavy burden, making them damaged rather than privileged characters. When you see them struggle, when you see them fall… you can’t help but offer them your sympathetic hand of redemption. Or at least that’s my opinion – there’s a great essay on this topic titled “Legacy of the People: The Burdens of Thorin Oakenshield and Boromir of Gondor” written by Dark Jackal, published on one of my favourite Middle-Earth websites – thorinoakenshield.net, among numerous other, equally interesting articles, which I heartily invite you to read. My most favourite Middle-Earth hero from the book was and forever shall remain Faramir. Faramir! I believe he was the first fictional hero I’ve actually fell in love with and even though “I’m not the same hobbit I once was” he still holds a very special place in my heart. I could write on and on about my choice, but I bet most of the TOR’s visitors have already fallen asleep reading this interview, so let me say this: I’ve met a lot of would-be Thorin Oakenshields in my life but not a single Faramir! Undisputed kindness along with unparalleled wisdom, like a dragon in the Shire, have not been seen in our bitter reality for over a thousand years. If ever.